I'm Entering The Real World And I Need An Adult Car! What Should I Buy? 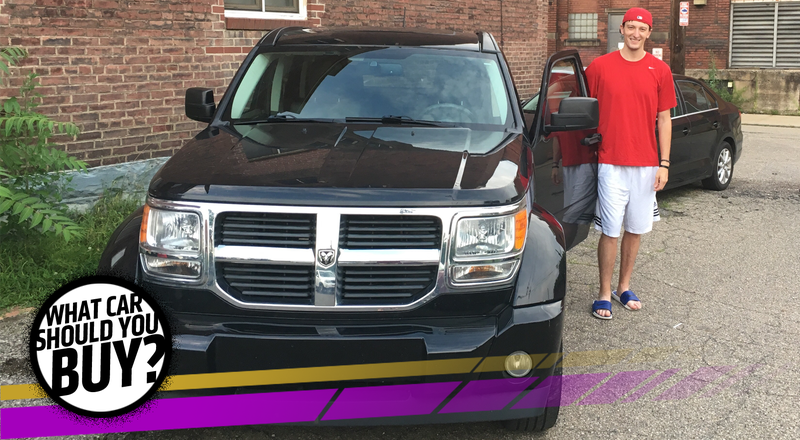 Brenden has been driving his Dodge Nitro for the past six years and it has treated him well through college. Now that he is about to enter the real world he needs something more adult. What car should he buy? I am a recent college graduate who has been driving a 2007 Dodge Nitro for the past six years. The Dodge has been a pretty good car, but it’s getting up there in the miles and I want something reliable to get me to work. I’m finally looking to upgrade to something that will make me feel like a grown up, while still being fun to drive and something a little different. I want midsize SUV with four-wheel-drive. I live in Pittsburgh, PA so it has to be able to handle some snow. I would also like something that is fairly well equipped with some nice features. I see where you’re coming from, Brenden. You can’t be showing up to your “real job” with a car that was named after an American Gladiator. People are going to give you a hard time for worrying about “projecting the right image,” but like it or not that stuff matters, especially when you are just starting out. There are tons of SUVs and crossovers available for around $25,000 and you could easily end up with something that will just blend into the crowd. What you need is something that has some presence and style, without being over the top. That would be the Infiniti QX70, or the crossover formally known as the FX series. The original Infiniti FX turned some heads when it came out. Granted it wasn’t the most practical crossover for its size, but that isn’t a concern for you. It has a weird, but a strangely charming combination of sports car and SUV and because it’s an Infiniti you will get a nice helping of luxury features like leather seats and navigation. Here is a certified pre-owned 2014 QX70 that will even give you plenty of factory warranty balance for worry free driving. If you’re looking for a midsize SUV thing, you should treat yourself right and get a Subaru Forester. They’re nice, they’re usable, they’re fun and filled with self-worth. It’s not hard to find a very-nearly new one in your price range, too. It’s not a midsize SUV at all. It’s a wagon. It’s a turbo wagon. I was up at the Mt. Washington Hillclimb the other weekend, which was swarmed with rally fan Subaru owners in all types of Imprezas new and old. But the car that stood out was my buddy Steve Harrell’s Outback XT with a five-speed manual. It’s like a Subaru WRX but with a more handsome and significantly more spacious body. The ride is good. The power is good. The usability and visibility is outstanding. It’s a Good Car that happens to be better than it has any right to be. Even the leather interior is nice. The newest one you’ll find will have two zeroes in the year, but the car still looks fresh and respectable. Finding the lowest mile, best-preserved example (like this 2009) will still run you 10k short of your asking price, money that I would pocket with pleasure. My coworkers are tired of hearing it and readers are tired of reading it, so I’ve been holding back on recommending Jeep Cherokee XJs for many, many weeks. But I can’t live this lie anymore; my heart can’t take it: just buy a damn XJ. Seriously, the thing can handle way more than just snow; it’ll take down rocks, blast through mud, and probably make quick work of even the gnarliest of lunar surfaces. As far as making you feel like a “grown up,” what can possibly feel more grown up than driving a vehicle built on technology from the 1950s? This means you get to walk into the store and say old-timer-ish things like “Hey Billybob, you got a distributor cap for a four-leeter?” These millennial kids driving around in new Corollas don’t even know what a distributor is. You’ll wow them all with your grown up-ness. As for nice features, you can get a Limited model with leather power seats, power mirrors, an overhead console, and keyless entry. What more could you possibly need? On top of all of this goodness, nice XJs go for about five or six grand, so you’ll have 20 large leftover to pay for basic maintenance (which is all this Jeep will need to last the rest of your lifetime) and for therapy, which you’ll need after having driven that Nitro for so long. Look, since you’re now an adult, you’re grown-up enough to take some real, honest talk: you don’t want a midsize SUV. You want to be an adult, not some stunted man-toddler who still pretends he’s going to go rock climbing some day in some SUV that will never do it. You want to be an adult, you need a car that broadcasts that you’re a powerful, responsible, fully grown-up member of productive society. Something with some presence, some gravity. Something with twelve cylinders. Yes, you need this Volkswagen Phaeton. It has everything you want: it’s unusual, absurdly well-equipped, has all-wheel drive, and it will make you feel so grown up that most people will probably just start addressing you as “Ambassador,” or “Senator,” or something like that. Get some midrange SUV and you won’t be an adult, you’ll just be another anonymous whomever in a mall parking lot. Get a W12 VW Phaeton and you’ll be a legend. An adult legend. You drive a Dodge Nitro, my guy. Just get A Car. Literally any car. It’ll be an upgrade. I promise. Front-wheel, rear-wheel, all-wheel, side-wheel, doesn’t matter. You’ll be improving your life. If “LITERALLY ANY CAR” is still too much choice for you, here’s a 510-horsepower Mercedes-Benz ML63 AMG, with money left over to spare for repairs and maintenance. You’ll have fun, and it’ll be Literally Any Car. Also, Jesus Christ, Tom. Recommending this poor guy some Infiniti crossover sadness. No reason to be mean just because he drives a Dodge Nitro. I Need A Cheap Coupe For A Long Commute! What Car Should I Buy?